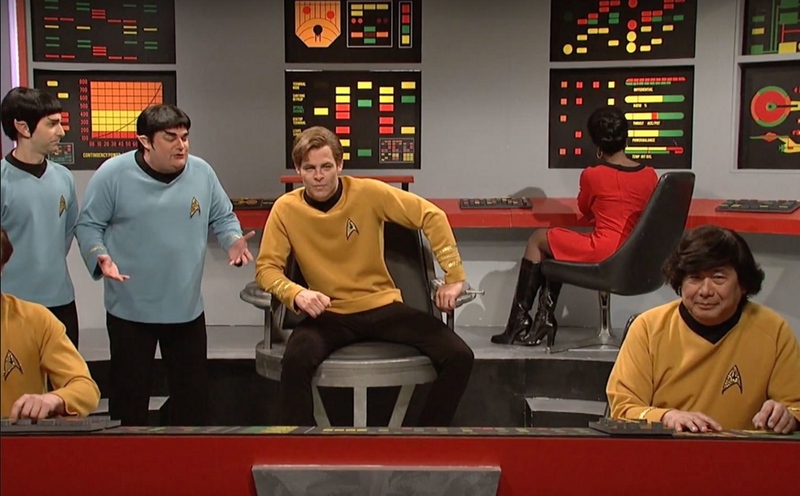 Above: Akira Yoshimura (right) as Sulu with Chris Pine as Kirk, Bobby Moynihan as Spocko, and Kyle Mooney as Spock in a 2017 “Star Trek” sketch on “Saturday Night Live.” Below: Yoshimura as Sulu with John Belushi as Kirk and Chevy Chase as Spock in a 1976 ‘SNL’ sketch. But what stood out for Vanity Fair, You Offend Me, You Offend My Family (YOMYOMF) and other online observers was the fact that Sulu (played by George Takei in the original series and John Cho in the last three movies) was portrayed by Akira Yoshimura, who is not an actor but the show’s longtime production designer. 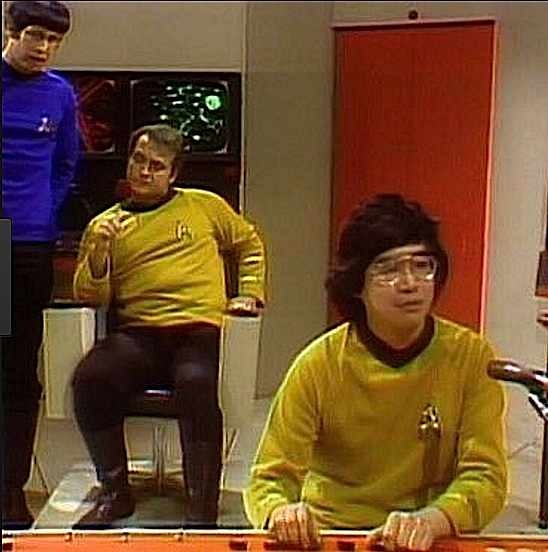 Yoshimura also played Sulu in 1976, during the show’s first season, in a “Star Trek” sketch with John Belushi as Kirk, and reprised the role in 1986 (opposite Shatner as Kirk) and 1994 (opposite Patrick Stewart, Capt. Picard from “Star Trek: The Next Generation”). In her May 7 Vanity Fair article, Joanna Robinson said the latest sketch underscores “the depressing fact that four decades into its run, ‘SNL’ has never employed a full-time Asian cast member. (Rob Schneider is a quarter Filipino and Fred Armisen a quarter Japanese.) And you can count the number of Asian hosts ‘SNL’ has had in the past four decades on one hand: Jackie Chan, Lucy Liu, Aziz Ansari. Pacific Islanders have had some representation. Dwayne “The Rock” Johnson, who is half Samoan, has hosted five times, including this year’s season finale. “SNL” has been criticized in the past for having white actors play Asian characters. In the late 1980s, cast member Dana Carvey was taken to task for portraying a stereotypical Chinese character, Ching Chang, who spoke with an accent, wore thick glasses, and was emotionally attached to the live chickens he sold. In 2012, Armisen, Cecily Strong and Nasim Pedrad played Chinese iPhone factory workers, with thick accents, black wigs, and one character’s Coke-bottle glasses. In 2015, comedian and actress Margaret Cho criticized “SNL” for its lack of Asian representation and for allowing Donald Trump, “a known racist,” to host the show. She suggested Takei or Ken Jeong (“Dr. Ken”) as possible hosts, and herself as a musical guest. There has been an online campaign to have Takei host the show, but to no avail. Fox’s African American-oriented sketch comedy show “In Living Color” added Steve Park (“Do the Right Thing”) to its cast in 1991 and 1992. Being the only Asian American cast member, he ended up playing any Asian character, male or female, including Connie Chung. From 2001 to 2009, Fox’s “MAD TV” featured comedian Bobby Lee (“A Very Harold and Kumar 3D Christmas”), who played such characters as Kim Jong-Il, Connie Chung, the Blind Kung Fu Master, and Hideki the Average Asian. Cast member Alex Borstein (“Family Guy”) received some criticism for her portrayal of Ms. Swan, an Asian woman.